I was wandering through central London today, something I’d not had a chance to do for quite some while, and I ended up at Cecil Court. 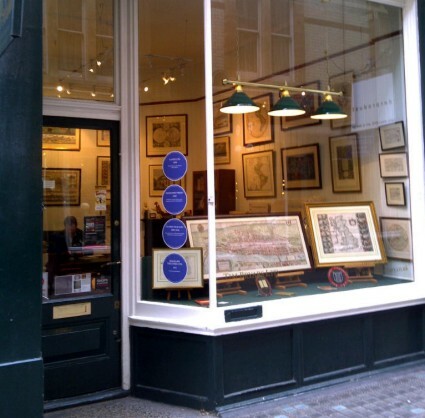 It’s a favourite spot, a short street of great charm linking Charing Cross Road and St Martin’s Lane, close by Leicester Square, and filled with bookshops of the antiquarian and first edition kind. It is also the first home of the British film industry, because it was here, between 1897 and 1911, that many of the film businesses then operating in London chose to have their offices – producers, distributors, agents, equipment manufacturers and more. It was nicknamed ‘Flicker Alley’, a name recalled with affection in many subsequent memoirs, and now of course the name given to an American DVD company specialising in silent film. What caught my eye were the blue plaques. London is filled with blue plaques placed on the walls of buildings which were previously home to great names of the past. The traders of Cecil Court have taken this idea and placed pseudo blue plaques in their windows, each one noting the name of a film business that used to be based in that building. That they have been able to do so is thanks to the work of Simon Brown, now of Kingston University, who has undertaken detailed research into early London film businesses, and wrote a paper on the history of ‘Flicker Alley’ for the journal Film Studies, a paper which happily is freely available online. Simon’s paper provides an understanding of the early London film industry, in all its many forms, viewed through the history of the businesses that came and went in Cecil Court. He provides tables which name each one, what their business was, and which was their address. You must turn to his paper for the full details, but the companies there from 1897-1906 were Biograph, Gaumont, Hepworth and New Bioscope, then from 1907-1911 New Bioscope, Vitagraph, Hepworth, Graham and Latham, Cinematograph Syndicate, Kamm, Williamson, F.A. Fullager, Nordisk, Williamson Dressler, Central Electric, Globe, Precision, Paragon, International Film Bureau, Rosie, Globe, Tyler, Films Ltd, New Kinematograph Enterprises, Biograph Theatres, Mansell, Theatre Chocolate Co., American Film Releases, Cinema Halles, and more. It was the more that interested me in particular, because at no. 8 Cecil Court there were plaques for Bioscope Press i.e. the original Bioscope film trade journal, and Ganes, publishers of the journal and its annual directories. Every other shop in the short street has these plaques in their windows, and one would be hard pressed to think of anything to compare with it in terms of modern-day buildings marking their cinema history heritage (or indeed any other heritage) in such a concentrated and compehensive form. The plaques were put there following a Cecil Court festival held last year, and it is terrific to see how the street has taken to its special place in film history. You can read all about the street’s history, going back to the seventeenth century, on the Cecil Court website, which also provides details of every shop there today. Now, will someone do the same sort of research for the street to which the film businesses then gravitated, once they got too big for Cecil Court, namely Wardour Street? Thanks Urbanora for the kind words about the research. The Cecil Court festival was fantastic. The highpoint for me was going into the basement of one of the shops – a rare priviledge – and while browsing the stacks I realised that the shelves had faded writing on them saying “In”, “Out” and “For Cleaning”. I certainly hope that Cecil Court continue the festival. I also recommend, should you be so inclined, to follow Cecil Court on Facebook where they post interesting, occasionally film related updates. I meant to write about the festival at the time and it didn’t quite happen. It would be great if it could continue. I was chatting to Ian Christie the other day about the importance of popularising research. I think we made quite a good job of it with the London Project.